Syracuse Stage is committed to providing students with rich theatre experiences that connect to and reveal what it is to be human. Research shows that students who participate in or are exposed to the arts show higher academic achievement, stronger self-esteem, and better ability to plan and work toward a future goal. 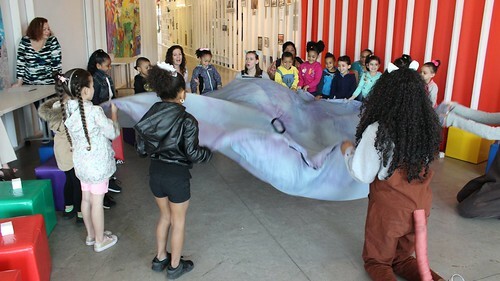 Live performance provides children and young adults with a unique sensory experience that enriches classroom study and promotes creative expression and cultural awareness. Each season, Syracuse Stage engages nearly 21,440 students from all across New York State with a variety of programs. The Education Advocacy Board is a group of teachers from the Central New York region who meet four times a year at Syracuse Stage to share their ideas and concerns about current arts education issues. Members work with Education staff at Syracuse Stage to help tailor programming to best fit the educators and students served. This past year topics discussed have included creating more useful study guides, exchanging views on future programming, working towards more effectively engaging young people in the arts, as well as discussing the influence of the Common Core on arts education.